because it’s worth knowing about it. Autumn is always a difficult and challenging time for me, with intense stress. When I come back to the office from holidays, there is no time to adjust, I just dive deep in. Everyday work concerns me from early in the morning until late at night, as we are preparing the most demanding issue of the year, the October anniversary issue that you are currently reading! Always in this season, the consequences of stress on my skin have their effect on my skin and its “bad days” begin! You may be suspecting how these days are … Besides, a woman’s skin is of female genre and so you understand very well what we mean when a female is in its bad days! Every day, I have an unpleasant burning feeling, itching mainly, and irritation. My skin can hardly tolerate anything. The truth is that I have sensitive skin, but these “bad days,” when I experience flare-ups of skin irritation, are my worst! And the symptoms may not be visible, but they are definitely noticeable, and they spoil my mood. A few days after their appearance I feel like I’m tired, something that the people around me see (Gone is the good and fresh look of the holiday). Indeed, I have so much to think of and worry about this time of the year. It’s too much for me to worry about my face on top of everything else! In such a climate of discomfort, a new Lancôme care product came to my office in the first days of September. Something new regarding the Advanced Génifique Youth Activator. 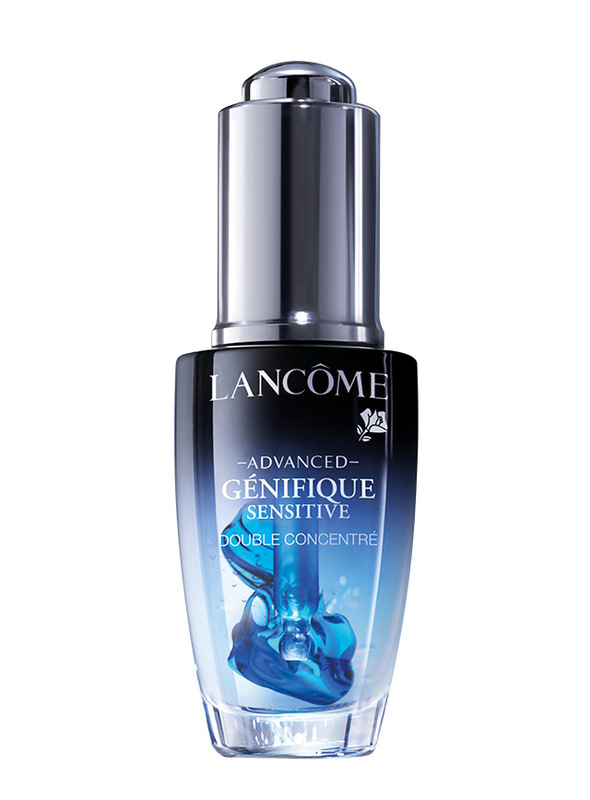 I read the first paragraphs of the press release, as I do every time, and I realized that Lancôme has created a bold, specialized answer to the problem of sensitivity exacerbations: The Advanced Génifique Sensitive. Unbelievable! This means I’m not the only one or one of the few women who face such a problem. The conclusion has come from Lancôme’s scientific research department revealing that such sensitivities are not a permanent skin condition, but a common, periodic phenomenon that affects all women, regardless of their age, type or color of the epidermis. Although “bad days” of the epidermis do not last forever, their impact is very important as they cause weakening, oxidation and inflammation. In fact, these sensitivity exacerbations may lead to premature aging of the epidermis. What does Advanced Génifique Sensitive achieve? This treatment offers all the power of the Advanced Génifique Youth Activator, now boosted with a new, soothing blend of probiotics and combined with a blue capsule containing 98% antioxidants. In fact, it contains an antioxidant complex consisting of vitamin E and ferulic acid. These two components drastically inhibit oxidative stress – possibly due to exogenous or endogenous factors – which tends to make the skin more vulnerable. This formula is particularly powerful, and difficult to stabilize. Lancôme’s laboratories managed to isolate it in a capsule, managing to keep its properties unchanged. It is then activated literally at the last minute for maximum efficiency. Activation with just one click! Keeping the serum in my hands and without thinking much about it, I activated it with a click and I decided to try it out on the same night. (Usually the new products get in the magazine archives and we may try some of them after they are photographed). It’s a fresh cosmetic so when I activated it I should not let it wait. I was tempted to add this product to my daily routine (accurately every night) to see if it really works. I also thought I was going through the best time to try it, hoping to relieve the symptoms I’m experiencing.